I'm a pretty ritualistic guy. When I catch The Tragically Hip in concert, I always wear my #5 Bill Barilko jersey. 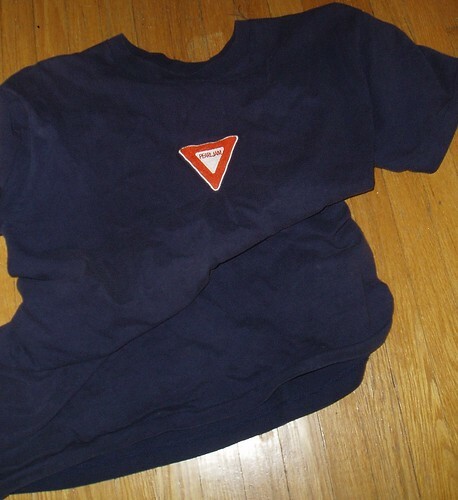 When I catch any other band in concert, I wear my Yield t-shirt purchased at Pearl Jam's 1998 show at Molson Park in Barrie. That 1998 Pearl Jam show in Barrie remains my favourite concert of all-time. It was a beautiful, clear night and Eddie and the boys were on point. I picked up a medium blue shirt promoting their Yield album and I wore that very same shirt on Saturday, ten years later. I'm wearing this thing into the ground. My was Niel Young, with Pearl Jam opening along with Soundgarden at the EX...that was great!! I was at that Pearl Jam show. Cheap Trick opened and you could see the guys from Pearl Jam dorking out on the side of the stage taking pictures of Rick Neilson. I still have the Pearl Jam soccer shirt somewhere.